More than a month has gone by since Canada's men's hockey team bounced back to win bronze against the Czech Republic after a disappointing semifinal loss to Germany, but the 25 members of the men's Olympic team remain close as they follow each other in their respective playoff runs. They have kept in touch through a chat room that was set up prior to the Winter Games in Pyeongchang, South Korea, and it doesn't take much for the group to chime in. It could be something that happened in the NHL or something that has transpired in one of the European leagues the Canadian Olympic team players compete in. There also has been some reminiscing from the Olympics last month. "Some of the best memories from the Olympics were the opening ceremonies, where everyone was so excited and seeing all the different athletes from different countries knowing everyone back home was watching, and remembering when I used to watch the ceremonies as a kid," Canadian defenceman Mat Robinson said when asked for his fondest memories from Pyeongchang. "Also winning a bronze medal was a big day in my life. Just the emotions of knowing how hard it was to get to that point and how much work I had put in and sacrifices my family had made and how it made everything worth it." If you recall, the Canadian roster was made up of six players from the Swiss National League, three who played in Sweden, one in Germany, three from the AHL and the remaining dozen from the Kontinental Hockey League in Russia. Robinson and CSKA Moscow have advanced to the West final against the powerhouse St. Petersburg SKA, a team that put 15 players on the gold-medal winning team from Russia. "The biggest challenge for my team against SKA will be their power play," said Robinson on the conference final series which begins on Thursday. "They have so much talent that they almost score at will on the PP. I have lost out to SKA in the past three seasons and their power play was always the difference in the series. The KHL season is down to its final four. 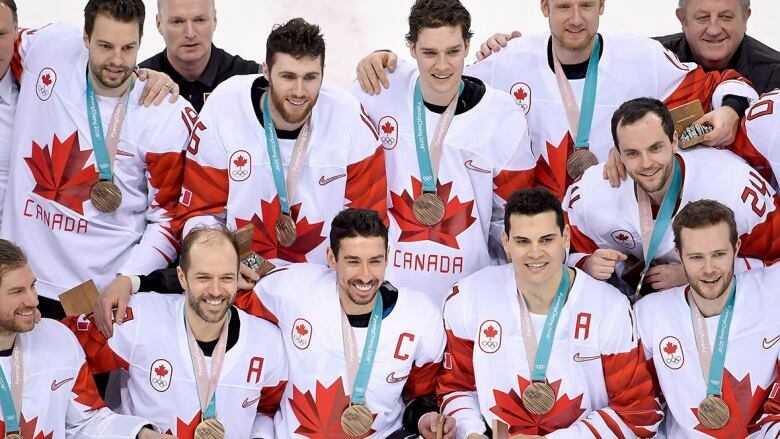 So the season already has ended for Canadian Olympians Eric O'Dell (HC Sochi), Gilbert Brule (Kunlun Red Star), Brandon Kozun (Lokomotiv Yaroslavl), Quinton Howden (Dinamo Minsk), Karl Stollery (Dinamo Riga), Marc-Andre Gragnani (Dinamo Minsk) and Chay Genoway for the soon-to-be-cut Lada Togliatti. Canadian forward Wojtek Wolski and defenceman Chris Lee, who both play for Metallurg Magnitogorsk, lost 4-1 in the best-of-seven East semifinal against Ak Bars Kazan. Robust Canadian forward Rob Klinkhammer plays for Ak Bars as does Justin Azevedo from West Lorne, Ont. Azevedo's shot at making the Canadian Olympic team was derailed with an early-season, lower-body injury that required surgery. But he has recovered nicely and has five goals and 15 points in 10 playoff games. Canadian goalie Ben Scrivens joined the group on the sidelines when his Salavat Yulaev Ufa team lost 2-1 in Game 7 in their Eastern Conference semifinal to Traktor Chelyabinsk on Tuesday. Of the three players who came from the AHL — Cody Goloubef, Chris Kelly and Christian Thomas — the 37-year-old Kelly earned a contract out of the Olympic Games with the Anaheim Ducks. The Ducks have gone 8-3-1 with Kelly in the lineup. Goloubef was given a two-way contract with the Calgary Flames upon his return from Pyeongchang, but his Stockton Heat are long shots to make the playoffs. Thomas and his Wilkes-Barre/Scranton Penguins are close to locking up a spot in the Calder Cup playoffs. Canadian third-string goalie Justin Peters and Kölner Haie were eliminated in the quarter-finals of the Deutsche Eishockey Liga. In Sweden, Derek Roy and Linköpings HC swept Stefan Elliott and HV 71 2-0 in the best-of-three preliminary round. Roy's team then fell to Rene Bourque and Djurgardens IF in the quarter-finals. All six Canadians in the Swiss National League are still playing. Goalie Kevin Poulin and EHC Kloten have gone 1-5 so far in the relegation tournament. Linden Vey and ZSC Lions — Auston Matthews' former Zurich-based team — snatched a win in the opener in the semifinal series against heavily-favoured SC Bern, which houses Canadian Olympians Andrew Ebbett, Mason Raymond and Maxim Noreau. Max Lapierre and HC Lugano are behind 1-0 in their semifinal series against EHC Biel, but Lapierre is enjoying a strong postseason with a league-leading four goals and 10 points in six games, one point better than Ebbett. No NHL, no problem for Pyeongchang — but what about Beijing?